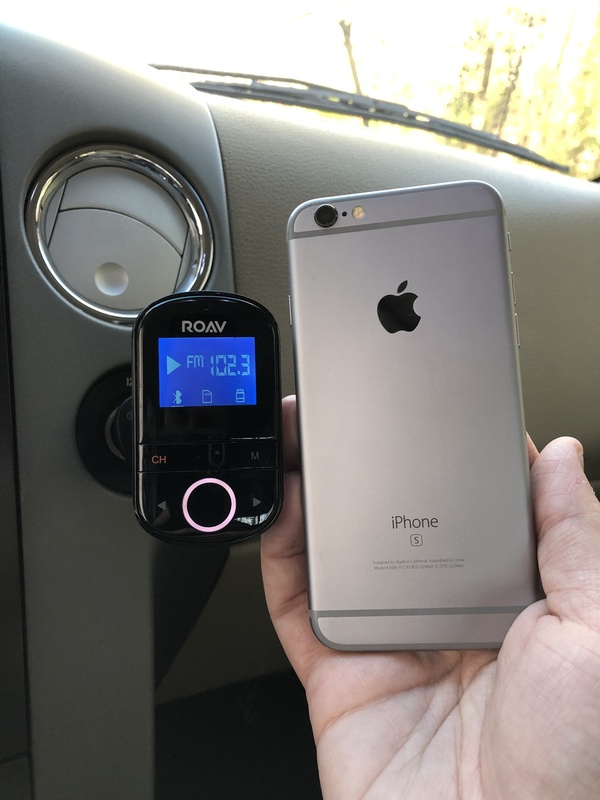 Thank you so much for selecting me to test the Roav SmartCharge F3! I truly hope that I get to test more of your awesome products in the future!! I bought a used truck a couple of years ago that didn’t have AUX in capabilities. I know I could pay someone a lot of money to install a hard line between my phone and the truck’s sound system, but I couldn’t bring myself to do it because of the cost and because I have two phone and one requires an adapter. The last thing I wanted to do was over complicate my setup, and I didn’t know how well an FM transmitter would work. I had one years ago and remember the scratchy audio and lack of EQ range that had while using it. Then I got to test out the Roav SmartCharge F3. It was truly love at first sight! Taking it out of the box, I was pleasantly surprised at how small it was. I assumed that the main unit would be just as big as my phone, but it’s about 1/3 the size! 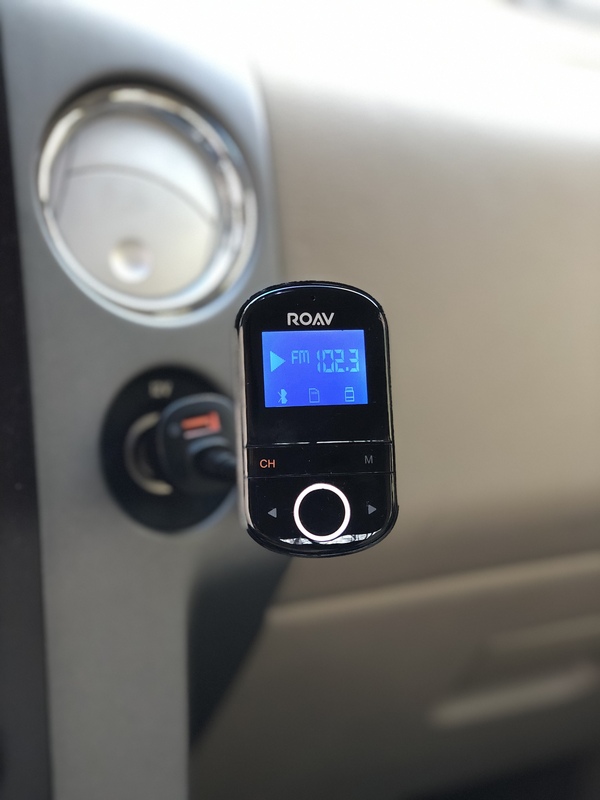 The sleek appearance enables the device to blend in with my older vehicle, while still having a clean presentation that would look good in brand new luxury vehicle. Initial setup was a breeze and didn’t take longer than a few minutes. But then it came time for the true test: sound quality. As I mentioned earlier, I didn’t have very high hopes based on previous experiences with FM transmitters. Add to that how I expected a company that paid such attention to the physical details of the device, they would naturally overlook the audio quality of what they were selling. BOY, WAS I WRONG!! My first song I played started with a nice guitar playing and some vocals. The mids were clearer than any radio station I have ever heard, and there was not a single scratch, or drop in audio. And then the bass hit. Suddenly, I was transported to a live concert and was standing 20 feet from the stage. The audio was that incredible. I kept expecting at some point for there to be an issue with the audio, but there was none. I am so glad that I never paid to have an AUX input installed in my truck!! This Roav SmartCharge F3 is so much better!! If I have one bad thing to say, it would be about the quality of the microphone used on the driver while talking on the phone. I could hear other people perfectly through my car speakers and there was no feedback issues (which is fantastic). However, the person on the other end of the phone had trouble hearing me clearly. The my complained of me sounding distant and muffled. It could very well be where I have the device plugged in and the angle in which it is trying to hear me speak, but I honestly didn’t want this device to call people (although it is still a fantastic feature). My main purpose in wanting my phone to come through my truck speakers was to rock out using songs and apps on my phone. And for that, I would HIGHLY recommend Roav SmartCharge F3! Great job with the review. Love the pics. Nice review! Love the pics.. thanks for sharing! Great review @Matt_Tabor ! Thanks for pointing out the receivers trouble in hearing you clearly on phone calls. I am waiting on the Bolt so hopefully all of that has been ironed out!